Warlingham Park Hospital was built in 1903. In 1965 the Management of the hospital found they had funds to spare and asked staff for suggestions as to how these could be used. John Ralph a Senior Charge Nurse at the time and his deputy Hayden Jenkins introduced the idea of a Bowling Club. In 1965 the Club became affiliated to the English Bowling Association and the Surrey Association. The pavilion was erected in 1966 with funds of £608 donated by the League of Friends. The pavilion was Officially opened on the 27th April 1966. John Ralph died in 1972 and his widow gave a cup in his memory and each year a day is set aside on our fixture card. The competition consists of singles, pairs, triples or fours. Our Honours Board started in 1966. Harry Whitfield, who was actively involved with the club, donated the trophy for the Men’s Pairs. The hospital finally closed in the year 2000. The site was sold for redevelopment and 168 dwellings have been built. This new estate is called Great Park. The bowls club was given a long lease of twenty years, which has since been extended. 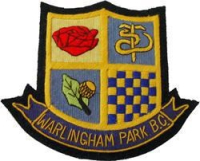 Warlingham Park Bowls Club then became a private club. The members pull together and take on the task of recruiting and fund raising with Fun Games and Social Events. 2002 a grant for £4,000 was raised to re-surface the paths around the green. 2006 the fund raising had successfully raised enough to create a small extension in order to accommodate six tables that are required for tea at a six rink bowls match. 2007 Lottery money was obtained to completely re build the toilet facilities and create a fit for purpose kitchen. Small grants were also received from Local Parish and District Council and donations from members. 2011 The Lottery supported us with our last extension to increase the size of our main hall and built on a new men’s changing room. Which was successfully completed in January 2012..
With a number of outstanding individuals who have given their time and efforts to the club plus, the membership who have supported the social side of things, we have achieved a great deal in twelve years. All in all our club now has one the best greens in Surrey, a big element of friendliness and some excellent bowling.